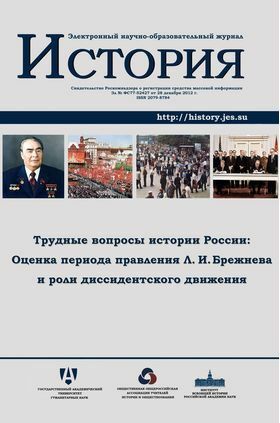 The handbook is dedicated to the dissident movement of the Leonid Brezhnev’s regime. Human rights and dissident movements created the necessary prerequisites for a new social and moral atmosphere. During the rule of Leonid Brezhnev, the main ideas of Rechtsstaat and the value of the personality were formulated. In the 1970s the government was forced to partially admit the existence of various socio-political movements, seeking to control them and maintain a «balance». Brezhnev regime has created reformist Party’s nomenklatura in its own layer structures, which took many of the dissidence ideas. The significance of these ideas fully revealed in the period of Gorbachev’s Perestroika, when the dissident ideas were accepted by the Soviet reformers.